I will most likely never walk into Babies-R-Us again....Yea!!! Why? Well, I developed a great disdain for Babies-R-Us when I was pregnant and it was time to register. I asked around and EVERYONE said you "have" to register at Babies-R-Us. This frustrated me for several reasons: 1) It's way too overwhelming. Too many products. What do you choose? 2) They make you believe you need more than you really need and 3) I like more of a boutique feel in the stores I shop in. Now that Lola is 6 months and I have my "must haves" and I feel like I'm more "in the know" there is no need to go to Babies-R-Us. I can go to stores like Right Start (http://www.rightstart.com/) and find not only what I need but also find the new and improved baby items. I love this store. Clay and I went this past weekend to search for Lo's first highchair. Unfortunately baby girls chubby legs don't really fit in the Bebe Pod anymore. I did my research beforehand and we decided on the Stokke Tripp Trapp highchair (http://www.stokkeusa.com/). It's not only baby chic and hip but it comes in fun vivacious colors which I love and it offers a plethora of features that your typical highchairs don't offer. If you can't already tell, we pretty much steer clear from all things that are baby like and traditional when it comes to baby purchases. I guess you could say we try to have fun with it....Why not??? 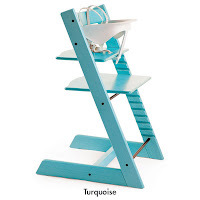 So we went with the very non-traditional turquois Tripp Trapp. To uphold my loyalty to eBay, I did look for a Tripp Trapp there first and wasn't able to find one in a color I wanted for a reasonable price so the next option was Right Start. Attached is a picture of our new highchair. I also bought a precious padded cover to go on it. I love that the chair is designed to pull right up to the table allowing the baby to have more interaction with family and helps them better learn social skills, language, etc. The best part is when you're done using it as a highchair, it converts to a regular chair for a toddler or adult. How great is that? Multi-function...gotta love it. It's amazing what you can get out of things that are thought out and designed well. On our journey to Right Start, we also found some other things. As you know, I love my glass bottles best but still haven't found the "must have" plastic bottle that is BPA free until this past weekend. After trying the Adiri and Born free bottles, I still wasn't completely sold for a number of reasons but I'm proud to say that I've finally found "the one"!!! So which bottle is the winner???? 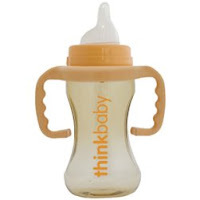 Drum roll please....it is the thinkbaby bottle (http://www.thinkbaby.com/). Why do I like this bottle better than the others? 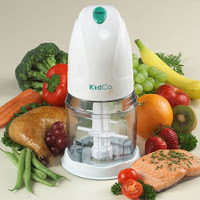 1) Like the others it is BPA free but in addition it is also free of Phthalates and PVC 2) It also has the venting system to reduce colic but it's much simpler and doesn't require additional parts / assembly and 3) The best part is they are reasonably priced. You can get 2 bottles for $16.99 and a the sippy cup was only $8.99. I'm so happy I finally found "the bottle". Of course, we'll only be using them for another 6 months but it's better late than never. But I now also know which sippy cups to buy. Woohoo!!! I can't tell you how happy I am about this find. I haven't had a chance to use the processor yet but I'm looking forward to it as I take on the challenge of making Lo's food. Right Start also has so many fun baby books. As I look through the fabulous choices my mind starts spinning...I never can make a decision. 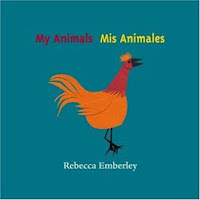 We ended up buying these precious books by Rebecca Emberly entitled "My Colors Mis Colores", "My Animals Mis Animales" and "My Numbers Mis Numeros". What a great / simple way to incorporate English and Spanish. In addition, most of the words in these books I can actually pronounce and that's a plus. 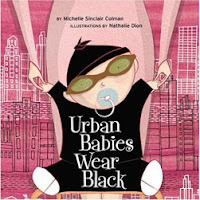 It doesn't stop there....I also loved this book "Urban Babies Wear Black" by Michelle Sinclair Colman. She also has several other books such as "Eco Babies Wear Green" and "Foodie Babies Wear Bibs". I really like this author. Most of these books are probably more for adults than babies but I still love them....very clever and fun with fabulous illustrations for all those modern babies out there! They also make great gifts. Finally, the best find were these great Rockabye Baby! 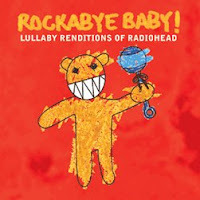 Lullaby Renditions of Radiohead, Beatles, U2, Rolling Stones, Pink Floyd and more. Clay was in hog heaven...he didn't know which ones to choose. Lola absolutely loves music so she'll get a kick out of these. 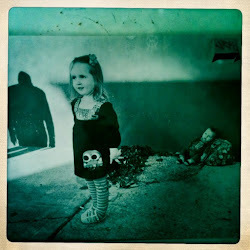 Her favorite band right now seems to be The Decemberist but maybe it will soon be Radiohead. Who knows! The only thing they are missing is a Lullaby Renditions of Wilco. I've put in my request. Anyway, those are my finds for the week and I'm pretty pumped about them. It didn't take us anytime to put all of it to use. Lo approves too!!! I have some other things too but decided I should wait for another day. I'm telling you....I'm back on my "A" game and it feels good. As usual, I'll keep you updated on my thoughts and reviews.